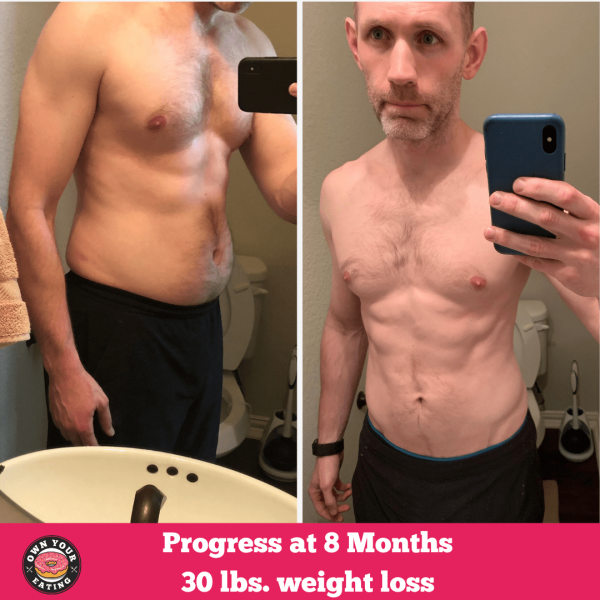 Ryan started working with Own Your Eating coach Jason in April and has lost 30 lbs. to date! Read on to find out more about Ryan’s experience in the last 8 months. I started around April 2018 (about 8 months ago). I started out with the Premium membership and now use the Essential membership. I had just started coaching CrossFit, and I knew that my biggest problem was my nutrition. One day, some of the members at my gym asked me about what to eat, and I felt a little embarrassed that I was very undisciplined. When I heard about OYE, one of the things that stuck out to me was the value of having accountability. And that has made all the difference. I’m no longer embarrassed when our members ask me about nutrition, I’m actually excited about it and have a lot of confidence when talking about food to the people I coach. I am stronger than I’ve ever been, and have been setting a LOT of PR’s in the gym. I even had to buy a new power lifting belt, because my old one is too big now! The biggest challenge for me has been the emotional aspect of eating. For a long time, getting out of the house or office to get fast food or soda was how I dealt with stress or boredom. It was a way to escape challenging circumstances. It is still hard for me, but I manage it by planning ahead. I know that I’m probably going to want to leave the office and walk to Starbucks, to get a break from work in the afternoon. So I just plan ahead for it in MyFitnessPal. Starbucks! I go to Starbucks almost every day. It is my biggest “vice” and before, I’d just hope that it wouldn’t hold back my progress too much. Now, as long as I’m getting 800g of veggies and lots of grass-fed/free-range meats each day, I never think twice about enjoying a drink from Starbucks! Never stress about having a bad day. One bad day can’t ruin a good diet, just like one good day can’t fix a bad one. Just forget about it, and move on. Consistency is key, and you’re in this for the long-haul. Don’t let the past keep controlling you. Find out more about coaches on the Our Team section of our site. Want to learn more about our coaching services? Head on over to the Lifestyle Coaching page and check out the “How it Works” section.